S3FUSION® NANO Marine Primer contains no wax, silicone, Teflon, abrasives, or petroleum distillates. As a result it lasts longer, never streaks, leaves no residue, and is easier to work with. There is no other product like it on the market. Deep penetrating – Forms a permanent barrier – Repels water, dirt, dust – Bonds to the surface Resists algae, barnacles, hull scum, & Zebra mussels – Provides Deep UV Protection – Reduces hull drag – Increases Speed “YACHT to try it”!! S3FUSION® Nano Marine Primer is designed for all types of boats except wood. It also can be safely used on ATV bodies, jet skies, water skies and surfboards. S3FUSION® NANO Marine Primer forms an optically clear protective layer that bonds to the microscopic surface abnormalities we can not see. It is the most technologically advanced marine primer coating on the market. We used our patent pending “NanoFusion Technology” to create this advanced product. S3FUSION Nano Marine Primer is a revolutionary product that provides a super slick, long lasting, high luster finish that actually becomes part of the boat surface. S3FUSION Nano Marine Primer is economical too. No streaking or powdery residue ever! Guaranteed. Being no larger than 1/80,000 of a human hair allows the nano-molecules of Magnesium, Titanium, and Zinc to go far deeper into the surface than large molecules like silicone, Teflon, petroleum distillates(kerosene, paraffin, mineral oil), and Carnuba wax which are found in many, if not most, of the leading brands on the market! S3FUSION® NANO Marine Primer reduces friction and drag by filling in all of the microscopic abnormalities deep in the surface being protected. This helps prevent algae, barnacles, hull scum, and Zebra mussels from finding points of attachment. In addition, dust, dirt, and grime can be easily removed saving time and energy. Winning races? 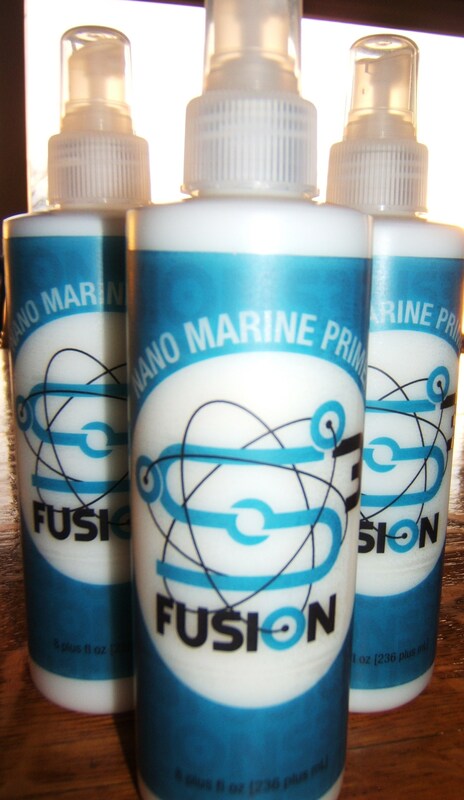 S3FUSION® NANO Marine Primer can only help your boat go faster!! S3FUSION® NANO Marine Primer bonds to itself and to the surface to which it is applied. It produces great UV protection, is anti-static, and is hydrophobic to resist water. It is optically pure so multiple coats never build up and cause problems. Being so slick, it may even reduce fuel use! S3FUSION® NANO Marine Primer contains a special blend of extremely small Nano-polymer molecules which penetrate far deeper than any other product on the market. Once applied, their advanced chemistry allows them to fuse to each other and to the microscopic abnormalities on the surface. This deep bonding allows a level of protection not available in any other product. The molecular size of the molecules in other products is too large to work like S3FUSION Nano Marine Primer. Since it contains no abrasive chemicals it will not make a dull oxidized finish shiny. 1. Depending on the age and condition of the boat’s surface, you may want to use S3FUSION® Heavy Duty Marine Cleaner before applying the S3FUSION® Nano Marine Primer. Use S3FUSION® Heavy Duty Marine Cleaner to clean the surface. 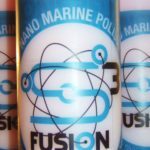 This will remove barnacles, algae, stains and some oxidation, and open the pores to allow S3FUSION® Nano Marine Primer to penetrate and adhere to the surface. Start with a clean surface. S3FUSION™Nano Marine Primer is water based so it will work well even if the surface is not completely dry. 2. Apply 3 coats of S3FUSION® Nano Marine Primer with a brush, roller, pad ,or spray. The surface should be clean and dry prior to application. If the surface is very porous, apply as many coats as necessary until the surface become saturated with the S3FUSION® Nano Marine Primer; flood the surface with the product when applying. Allow 8 to 10 hours for the coating to penetrate and cure. If the surface remains wet after 10 hours, wipe off the excess with a dry towel and buff gently with a microfiber polishing pad until the surface becomes dry and smooth. Spray S3FUSION™Nano Marine Primer directly on to the surface. Make sure all of the surface is covered. Rub the polish into the surface. We have found that on large hulls a microfiber cloth attached to a Swiffer will be perfect to spread the polish. Apply the first coat to the entire hull. Once you reach your original starting point, apply a 2nd and then a 3rd coat. 3.For best results, especially if using S3FUSION™Nano Marine Primer for the first time, always apply three coats to create a deep level of protection and a brilliant better than showroom shine and deep luster finish. 4. S3FUSION™Nano Marine Primer can be applied in the sun or shade.